The Black Rapid strap has been a favorite of photographers since it was introduced. If it is possible for the best to get better, the new model, the Sport Breathe, is better. Use the new Black Rapid Strap with a Really Right Stuff clamp glued on for added support and you will never take your camera out without it. Really Right Stuff married a special clamp to the Black Rapid Strap because of the demand. Look at the YouTube video explaining the convenience and safety afforded by the combination. The Sport Breathe Camera Strap is “built for the sport or adventure photographer who is carrying one camera and intends to move quickly whether on flat or rugged terrain,” according to Black Rapid. Like prior Black Rapid products, the construction is high quality. The Sport Breathe Camera Strap features a moisture-wicking, shoulder pad and is designed to be lightweight. It also comes with spring-loaded bumper locks that can be slid up and down the webbing. The locks are intended to reduce excess camera movement along the length of the strap. The standard model is designed for right-handed photographers. It is worn across the body from the left shoulder to the right hip. There is a similar model (Sport Left Breathe Camera Strap) designed specifically for left-handed users. Both models come with a Black Rapid Brad Breathe Stabilizing Strap that secures the strap under the shoulder and helps prevent the camera equipment from bouncing and twisting. The camera hangs upside down at the waist to make it easy to begin shooting. 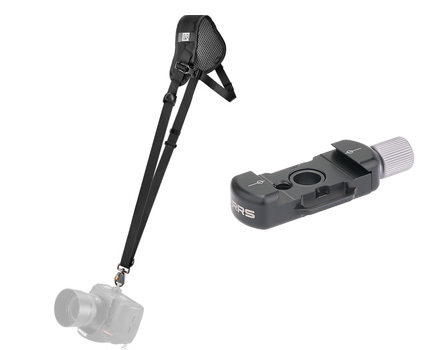 The Black Rapid Sport Breathe Camera Strap sells for $81.95. Of course, no one wants to hear the horrible sound of the camera detaching from the strap and smashing on the ground. The new RRS B2-FABN Micro clamp is a solid choice for added security. All you need to do is attach the strap to the clamp, and then mount the clamp to any of your RRS plates. The professional-style knob locks securely onto most Arca-Swiss style plates. The centered QD socket is solidly constructed of steel and features a ferritic nitrocarburizing treatment for a hard, wear-resistant surface. According to Really Right Stuff, it is built to support up to 25 pounds. The RRS B2-FABN Micro clamp retails for $65.00.